University of Malta, and L.S.E.—University of London, External Program, Malta. Received February 19th, 2010; revised April 8th, 2010; accepted April 10th, 2010.
with debilitating emotional disorders and past traumas. has been a one-sided view of human being.
. The first parenting style is the optimal one . not religiosity predicted subjective well-being [21,22]. maltreatment, as it never occurs in a vacuum [24,25]. systems on the well-being of family members [27,28]. influence by a dominant Catholic faith [29,30]. and child protective services are still in their infancy . resource in treating victims of childhood maltreatment. 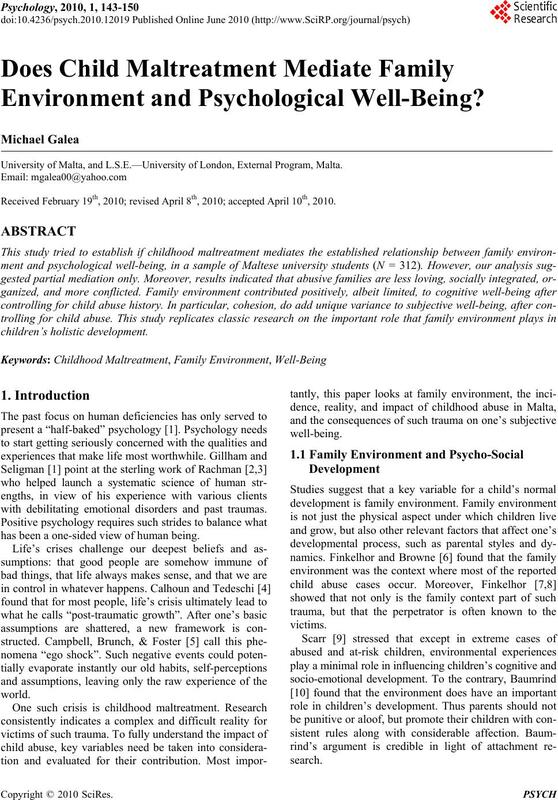 the social and environmental characteristics of families. Personal growth, and 3) System-Maintenance dimension. members (e.g., “We fight a lot in our family”). very few rules to follow in our family”). the clear statements relating to the 10 subscale domains. sample was found to be at 0.95.
studies that validated the CTQ . children, let alone for those already scarred by abuse. and an outcome variable (e.g., well-being). be less in the third equation than in the second (path c’). ables. Results are shown in Table 2. < 0.001. Results thus indicate only a partial mediation. 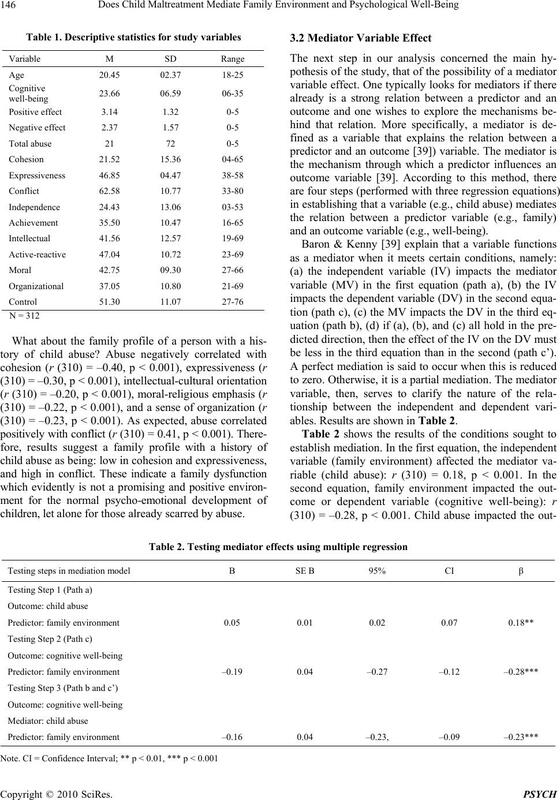 The Statistical Mediation Model is shown in Figure 1.
diator of the relation between family and child abuse. causes poor well-being, and poor well-being causes abuse. tween family environment and psychological well-being. tive well-being after controlling for child abuse history. nflict significantly correlate with child abuse and neglect. deeper into the stark reality of childhood maltreatment. give a better picture when included in the equation. tive consequences on such a vital cell within society. of the reality of child abuse. 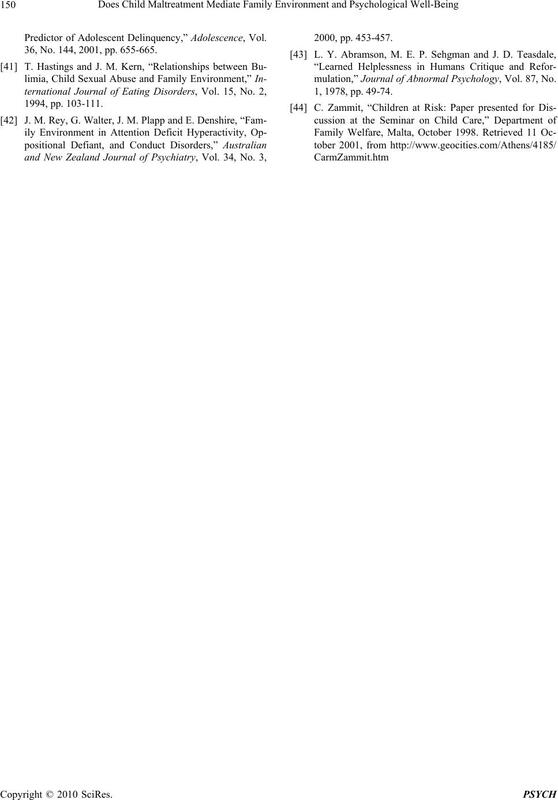 J. E. Gillham, K. J. Reivich, L. H. Jaycox and M. E. P.
Science, Vol. 6, No. 6, 1995, pp. 343-351. 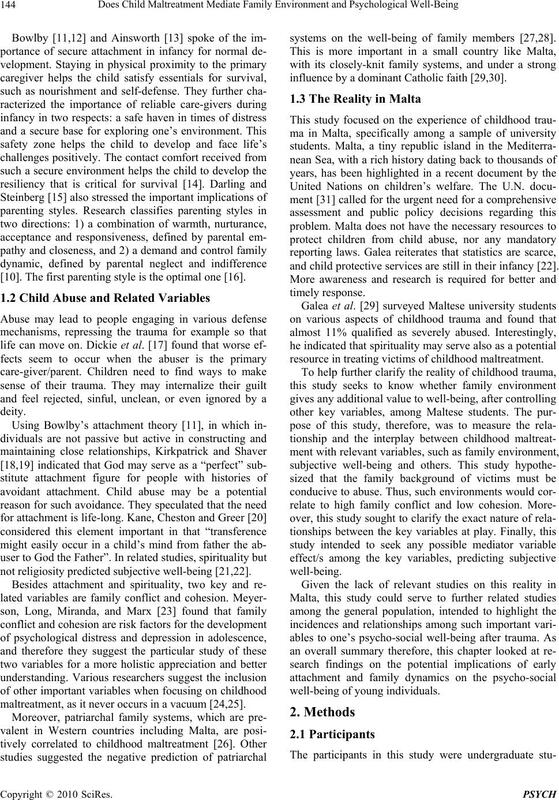 Behavior Research and Therapy, Vol. 17, 1979, pp. 1-6. S. Rachman, “Fear and Courage,” 2nd Edition, W. H.
logical Inquiry, Vol. 15, No. 1, 2004, pp. 93-102. Psychological Inquiry, Vol. 15, No. 1, 2004, pp. 22-26. Journal of Orthopsychiatry, Vol. 55, No. 4, 1985, pp. American Medical Association, Vol. 280, No. 21, 1998.
chology, Vol. 41, 1996, pp. 149-150. Developmental Psychology Monographs, Vol. 4, No. 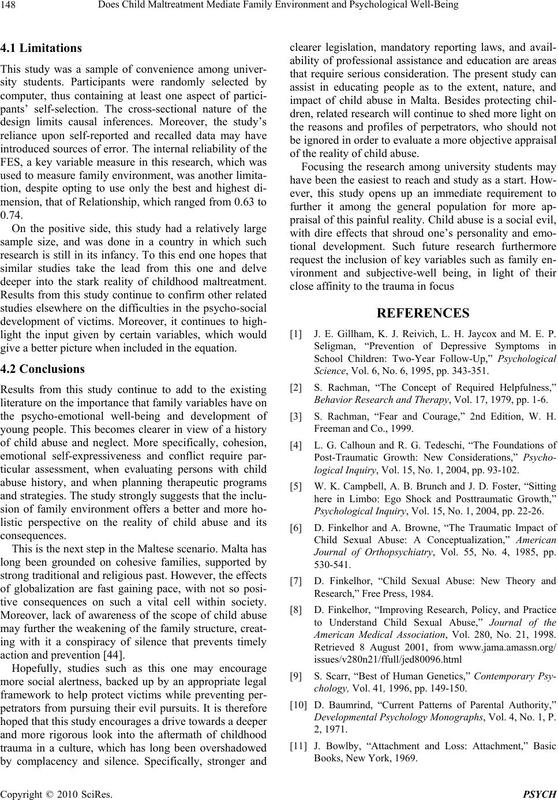 1, P.
Psychologist, Vol. 34, No. 10, 1979, pp. 932-937.
sponses in the Infant Monkey,” Science, Vol. 130, No. No. 3, 1993, pp. 487-496.
therapy, Vol. 11, No. 3, 2004, pp. 187-198. Belief,” Personality and Social Psychology Bulletin, Vol. 18, No. 3, 1992, pp. 266-275. No. 3, 1990, pp. 315-323.
chology and Theology, Vol. 21, No. 3, 1993, pp. 228-237.
dents,” Pastoral Psychology, Vol. 57, No. 3-4, 2008, pp. glect, Vol. 26, No. 4, 2002, pp. 387-406. Vol. 59, No. 5-A, 1998, p. 1787. Abuse & Neglect, Vol. 18, No. 3, 1994, pp. 215-224. Abuse of Children, Springer Pub. Co., New York, 1988. 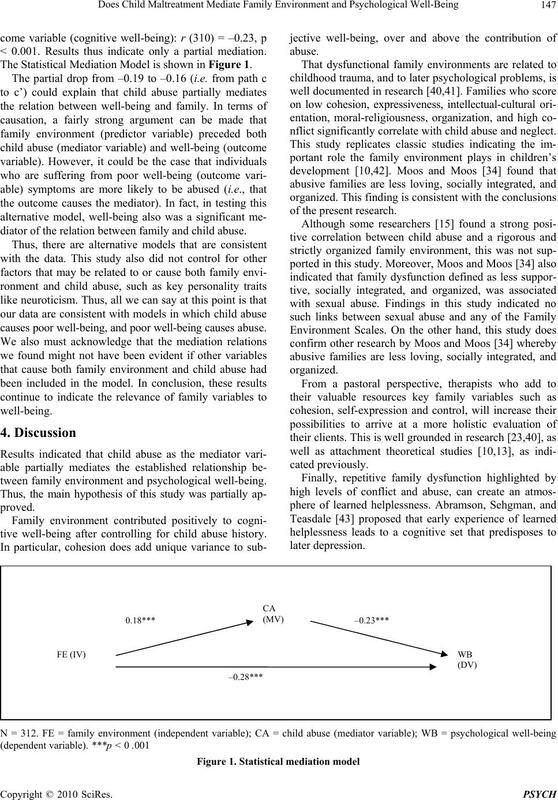 J. M. Whealin, S. Davies, A. Shaffer, J. Jackson and L.
Journal of Family Violence, Vol. 17, No. 2, 2002, pp. M. Galea, J. W. Ciarrocchi, R. L. Piedmont and R. J. Research in the Social Scientific Study of Religion, Vol. 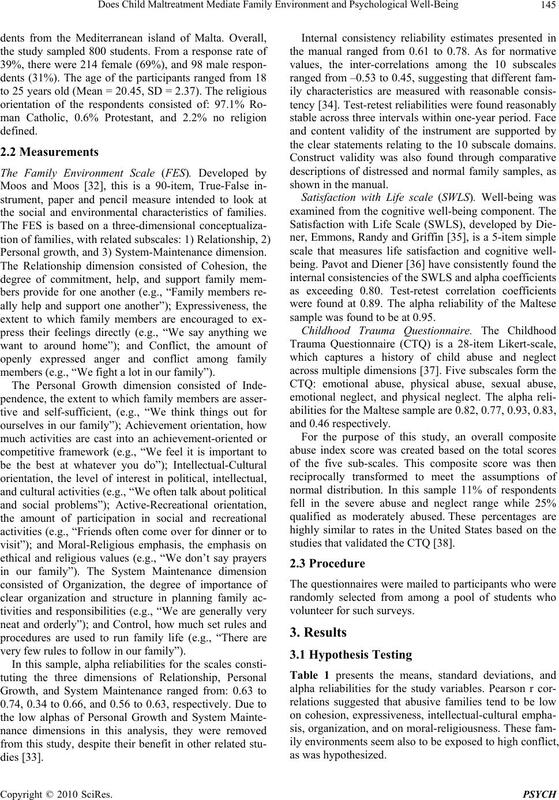 ma,” Advances in Psychology Research, Vol. 65, 2009, p.
the FES,” Assessment, Vol. 13, No. 4, 2006, pp. 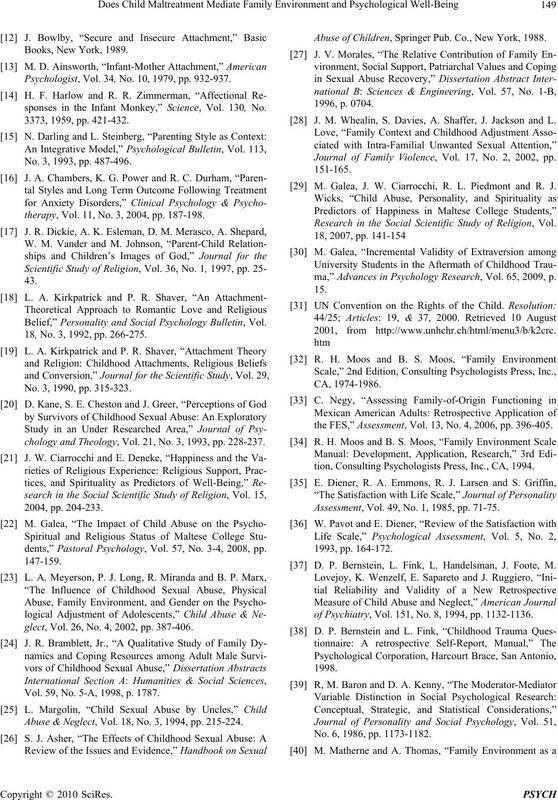 396-405.
tion, Consulting Psychologists Press, Inc., CA, 1994. Assessment, Vol. 49, No. 1, 1985, pp. 71-75. D. P. Bernstein, L. Fink, L. Handelsman, J. Foote, M.
of Psychiatry, Vol. 151, No. 8, 1994, pp. 1132-1136. No. 6, 1986, pp. 1173-1182. Predictor of Adolescent Delinquency,” Adolescence, Vol. 36, No. 144, 2001, pp. 655-665.
mulation,” Journal of Abnormal Psychology, Vol. 87, No.